image-in-ing: Almost time for mimosas! 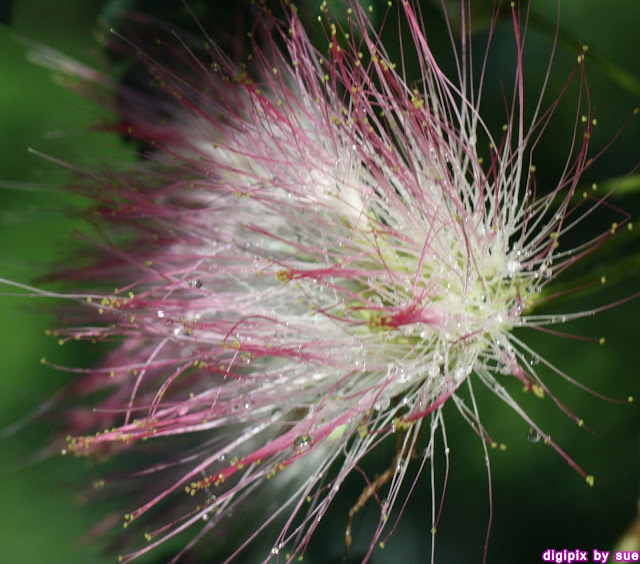 When I was a kid we called the mimosa flowers "hippie heads." A related tree which is common here in south Florida is the Poinciana, AKA "Flamboyant." Its seed pods are sometimes over 2 feet long. They contain poisonous alkaloids and cyanide. The eagles put them in their nest, possibly to deter parasites. And I didn't realize they contained potentially poisonous substances - not sure if our variety does as well. Also read the comment from Bhavesh Chhatbar below - his comment is also interesting. Wow! Amazing to see these flowers in some other part of the world! In our childhood, we used to call them Kaurav-Pandav based on an ancient Indian story where there were 100 brothers called Kauravs and their 5 cousins called Pandavs. The flowers seem to have hundred thread-like leaves and 5 filaments. It's one of my favorite trees! Perhaps it's called Rain Tree, which I guess is a national tree of some South-East Asian country! The tree grows huge! Such light and feathery flowers! Wonderful blooms... fantastic captures. Thank you for sharing. I love mimosa and miss it. Growing up my neighbor had a beautiful tree. Those are the prettiest flowers, so delicate. Hi! Very beautiful. Thanks for sharing. What a pretty and feathery looking flower. I've never seen or heard of it before. Enjoyed seeing it and the droplets add as it looks like glitter. Very nice. Pretty flowers. 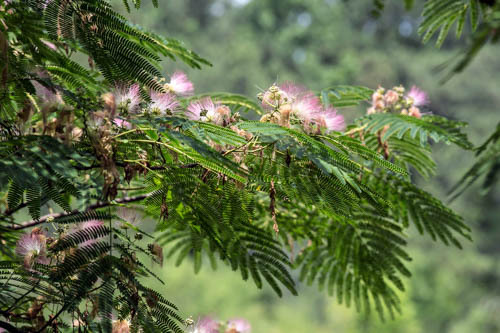 Mimosa trees are not common here but we have lots of mimosa grass or weeds. Happy Tuesday! So that's Mimosa? Sorry to be so ignorant about plants Sue. But, I am trying to learn. Such a pretty flowering tree! Have a wonderful week and thanks for hosting each week. Wow, those flowers are so beautiful and delicate. 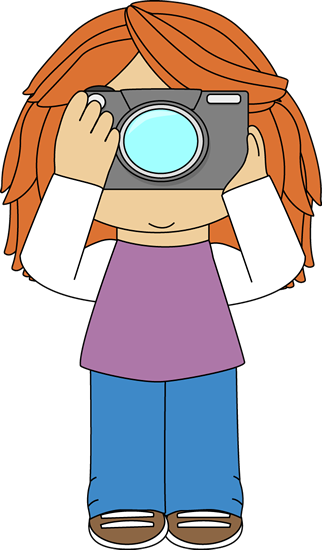 I love the detail you captured, Sue! 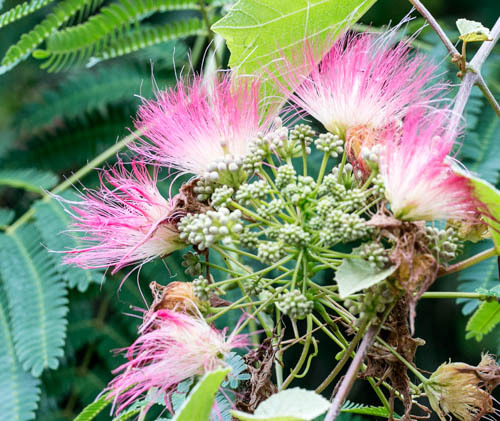 The mimosas that grow on our side of the pond look kinda different.They're not as pretty. Wonderful flowers! Almost blooming in Romania , too! Thats Mimosa? I've never seen ist! My Mom used to have on of these in her yard...so unique! Had to remove it to put in a new driveway. These are gorgeous. I have always enjoyed these trees/blossoms. Thanks for linking up today! Wonderful captured. I was not aware that there are also pink mimosas. Thank you for hosting and have a cheerful weekend. Such wonderful pics. Sorry I am so late. Thanks for hosting and I hope that you have a wonderful week.